BridgeArt.net was granted permission to reprint the following interesting article on collaboration using ProjectWise from CE News. The author of the article is Jackie Cissell, who is Americas marketing director for Bentley Civil. She can be contacted at jackie . cissell @ bentley . com. A 17-year bridge and interstate project uses ProjectWise collaboration software to share and manage files among 70 design firms. The $3.9 billion Ohio River Bridges (ORB) Project —located in Louisville, Ky., and Southern Indiana—is a massive undertaking that includes two new bridges over the Ohio River, twin 2000-foot tunnels, and an interchange where three interstate highways meet. When complete, the hundreds of engineering companies and contractors involved in the ORB Project will have helped develop best practices for civil project collaboration. The project is led by the Kentucky Transportation Cabinet (KYTC) and Indiana Department of Transportation, with oversight by the Federal Highway Administration (FHWA). This group constitutes the project managers referred to as the Bi-State Management Team (BSMT). Having just received FHWA authorization in 2003, ORB is still in the design phase, with 40 percent of design complete on the Kentucky side and 10 percent finished for the Indiana portion. Professionals from 70 firms are working to develop a context-sensitive design that integrates the project with adjacent businesses, historical and residential communities, and parks. Many facets of the environment are also integrated into the project. 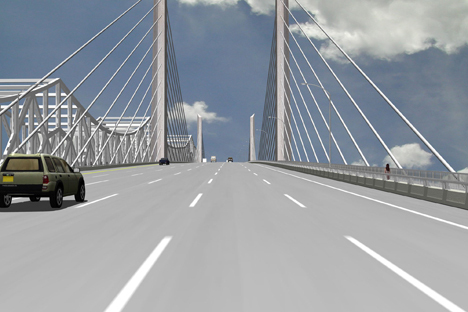 Rendering shows the Downtown Bridge, one of two new Ohio River crossings included in the $3.9 billion Ohio River Bridges Project in Louisville, Ky. The ORB Project faces the more stringent challenges of today's civil engineering projects, meeting Transportation Conformity Rules demands for everything from hot-spot and PM2.5 (particulate matter) analyses to federal Environmental Impact Statements. Remarkably, the ORB Project is all digital. Every project document for use by the FHWA and other key stakeholders is being delivered in electronic format only. At last count, approximately 300 professionals representing a majority of the firms involved are using Bentley ProjectWise to share and manage more than 25,000 files and 4,000 folders (75 gigabytes of data). Given the sheer size of the ORB Project, a top focus for project leaders from the beginning was how to manage the complexity and scale over an estimated 17 years. Coordination and communication between the owner agencies and the many design and construction firms were paramount concerns. Community Transportation Solutions (CTS), a consortium of three firms, was contracted as a general engineering consultant to oversee the day-to-day activities of the ORB Project, answering to the BSMT. Included in the consortium are HMB Professional Engineers, BLN Engineers, and Parsons Transportation Group. The project was divided into six major sections, with each section managed by an individual design team. CTS provides oversight for each of these teams. This organizational structure would serve the project well, but two questions demanded answers: how to share data effectively and how to propagate project standards? The KYTC—the lead on 68 percent of the ORB Project—brought to the table its experience using Bentley ProjectWise for project collaboration on a large scale. Based on KYTC's confidence in ProjectWise, the BSMT agreed that ProjectWise would be used on the project. It also specified the use of Bentley InRoads for civil design. KYTC had extensive experience with ProjectWise and had witnessed its ability to bring together data from many sources and enforce project standards. Moreover, ProjectWise had proven its ability to compress project schedules and reduce mistakes in the field. With the right information at their fingertips, designers had been able to redirect the time saved finding and managing files to the design aspects of the project. The hope was that these same benefits could be achieved by the ORB Project's 70 design firms that would be providing a diversity of core competencies. Each has different areas of expertise, schedules, ideas, systems, and technology implementations. Could ProjectWise maximize their individual potential while also achieving a milestone in project execution? In this environment, innovating with collaboration technologies would be no small task. Put to the test, ProjectWise enabled management and sharing of engineering documents across disparate networks. All project drawings, documentation, and correspondence were handled securely, in real time, across the Internet with ProjectWise Web Application Server. The Kennedy Interchange is the largest of the six major project sections. Known as "Spaghetti Junction," it is the intersection of three interstates—I-64, I-65, and I-71—located on the Louisville side of the Ohio River. A context-sensitive redesign opens up the interchange footprint, redirecting northbound I-65 traffic to the new Downtown Bridge and southbound I-65 to the existing Kennedy Bridge. Kentucky Transportation Associates (KTA) is the prime on the redesign of the Kennedy Interchange. KTA is a consortium of QK4, Palmer Engineering, WMB Inc., and Entran Consulting engineers, supported by approximately 20 sub-consultants. KTA's ProjectWise installation, the largest on the ORB Project, helps the KTA teams collaborate on design and manage more than 20,000 files. A KTA-appointed information committee developed drafting and plotting standards based on KYTC's design standards. With MicroStation Workspaces created for functional areas, the team assigned Workspace profiles in ProjectWise to enforce use of the correct project configuration files. The ProjectWise Plot Server handles final plan production and exhibit creation, enabling creation of 11- by 17-inch paper plots and PDF files. "With approximately 23 different entities and more than 200 people accessing information on this section, ProjectWise made it possible to coordinate information and files efficiently," said Glen Kelly, KTA project manager. KTA proved that it's best to think beyond the old paper-based process when putting collaboration technology to work. For example, one issue was always how to divide up the project among the many firms and then tie together the working project. In the past, it was standard to divide the project into distinct sections and assign them to various firms, each responsible only for their individual section. Instead, ProjectWise gave KTA the ability to design the Kennedy Interchange in a layered format with virtually no barriers. Freed from having to work in sections, KTA could assign work to match core competencies of the various firms. This process innovation allowed the 24 companies to match expertise to need and to perform the work of various disciplines simultaneously. Team members were always working with the right, most current information. It is a big plus that ProjectWise works seamlessly with Bentley products. Design moved at an excellent pace with the right information in hand. KTA performed extensive 3-D modeling of the project using InRoads, with highly accurate digital terrain models. InRoads 8.8 enabled the use of components, advanced template creation, and multiple-corridor modeling in one surface. Another large part of the ORB Project is the Downtown Bridge, designed by Michael Baker Jr., Inc. This bridge, lying just east of the existing Kennedy Bridge, is a three-tower, cable-stayed bridge that will carry northbound traffic via six lanes on I-65. The Downtown Bridge, designed by Michael Baker Jr., Inc., is a three-tower, cable-stayed bridge that will carry northbound traffic via six lanes on I-65. Like KTA, Baker depends on ProjectWise to share information effectively with its 11 sub-consultants and CTS. It is, in fact, Baker's official filing system for all documents, correspondence, and project drawings. "ProjectWise is changing the way we work, both at the production level and at the management level," said JB Williams, Baker Downtown Bridge Section manager. "How did we ever get work done before we had these tools?" In overseeing the day-to-day activities of the ORB Project, CTS is in a good position to judge the effectiveness of a managed environment. "While it is difficult to determine the monetary value of the savings from using ProjectWise, it is clear that a large savings does exist," said John Sacksteder, CTS project manager. Clearly, there are time savings in the document search. There are also time savings in having documents available when needed instead of waiting for them to be mailed, delivered, or placed on some other server site. According to Bentley, users have consistently reported savings in the range of 30 percent in this area. CTS figures the savings will be more than $9 million on the ORB Project. Only time will tell the extent of the "return on innovation" that will come from the ORB Project. Without question, those involved have already achieved considerable merit in innovative, if not visionary, approaches to project execution and collaboration, as well as engineering leadership. In recognition of its achievements in project collaboration, Bentley COO Malcolm Walter presented the KYTC a BE Award of Excellence for Best Return on Innovation at the 2007 BE Conference in Los Angeles.